It’s Not Just A Boy’s Club Anymore! Craft beer drinkers will cite their epiphany moment, the instant they tasted their “forever” beer – a hoppy IPA, a smooth wheat beer maybe it was a hearty stout. For most of us, it changed our drinking and buying habits. For others, it changed their life. So Golden quit her job, moved to Missouri and lived on her savings for a year to learn the craft beer business at O’Fallon Brewery in St. Charles, Missouri. Today, she is a brewer and manager of production operations at O’Fallon Brewery, one of a small but growing number of women brewers in the U.S. and an even faster growing number of women in the business and consumer end of craft beer. Just ask the women of Femme Ferment, a St. Louis organization celebrating the role women play in the industry. Indeed. Kim Jordan, co-founder and CEO of New Belgium Brewing in Fort Collins, Colorado, has been in the business since 1991. The Pink Boots Society, a national organization that helps women launch careers in craft beer, had 60 female brewers on their roster in 2007. Today there are nearly 250. And, according to craftbeer.com, women drink 25 percent of all beer by volume in the U.S., but consume 37 percent of the nation’s craft beers. The consumer side echoes the growth of women in the craft beer business. 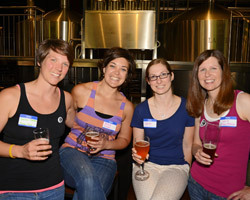 It’s an exciting time to be a “good beer” drinker, say the women of Femme Ferment. Within a few months the group has built a network of supporters through social media and events highlighting the talents of women in the industry. They held a launch party May 19 with nearly 50 supporters and then managed to snag their own informational table at this year’s popular St. Louis Brewers’ Guild Heritage Festival. Want to meet the women behind the movement? In addition to Brown and Herrera, the founders include: Sarah Scherer, director of marketing at International Tap House; Kristen Chalfant, representing Morgan Street Brewery; and Colleen Kirby, representing Civil Life Brewing, You can find them every third Tuesday supporting the craft brewing industry in St. Louis, during happy hour at various “good beer” emporiums around the region. July 15 they take the party to Bridge Tap House and Wine Bar, 1004 Locust St. in downtown St. Louis. You can also follow Femme Ferment on Facebook and Twitter. Maureen Zegel is a freelance writer and a regular contributor to The Healthy Planet magazine. This entry was posted on Saturday, June 28th, 2014 at 2:06 pm and is filed under July 2014. You can follow any responses to this entry through the RSS 2.0 feed. Responses are currently closed, but you can trackback from your own site.